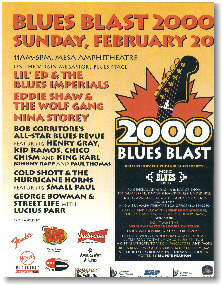 Blues Blast is Phoenix’s annual blues festival which is presented every February by the Phoenix Blues Society at the Mesa Amphitheatre and includes a great program of national headliners and local talent. Bob’s All-Star Blues Sessions CD had just come out and he put together a revue of some of the great artists that appeared on the album. This brought together a great cast of musicians including Henry Gray, King Karl, Kid Ramos, Lil’ Ed (who had done a set with his own band earlier in the program), Chico Chism, Paul Thomas and Johnny Rapp. Bob’s old friend, Eddie Shaw, was also on the bill that year and he came up to help with the finale. Here are some photos of that memorable set that closed out the festival.